Kitchens in Telford how it all began. grew rapidly through word of mouth referrals and recommendations within Telford and the surrounding areas. cabinets, A kitchen fitting only service or just simply the paint for hand painting your kitchen doors. So whatever your kitchen requirements we have the answer! We also supply and fit a complete range of fully fitted kitchens for both commercial and residential applications. We do not operate showrooms so all the savings we make are then passed directly on to the customer! With probably the largest range of made to measure doors available in the UK. You will find our prices very competitive. We sell high quality 15mm & 18mm kitchen cabinets, both flat packed and rigid to complement all our doors. We have a large range of handles and knobs, sinks, taps, splashbacks, worktops, pull out storage solutions, appliances and kitchen lighting. If you already have a kitchen plan or just want a quick makeover give us a call and one of our sales engineers will take you through the various option available to ensure your kitchen facelift meets all your requirements in terms of design fitting and budget. Our engineer will work with you to make sure you have all the items required for your facelift ensuring you can begin your project safe in the knowledge that you have everything you need to complete the job. Many people have a trusted tradesman and we are more than happy to work with you to supply all the items you require, leaving you free to contract the fitting service with someone you trust. If you prefer to work this way we can even provide you with a list of trusted tradesmen for you to select. The complete service from design to finished kitchen. 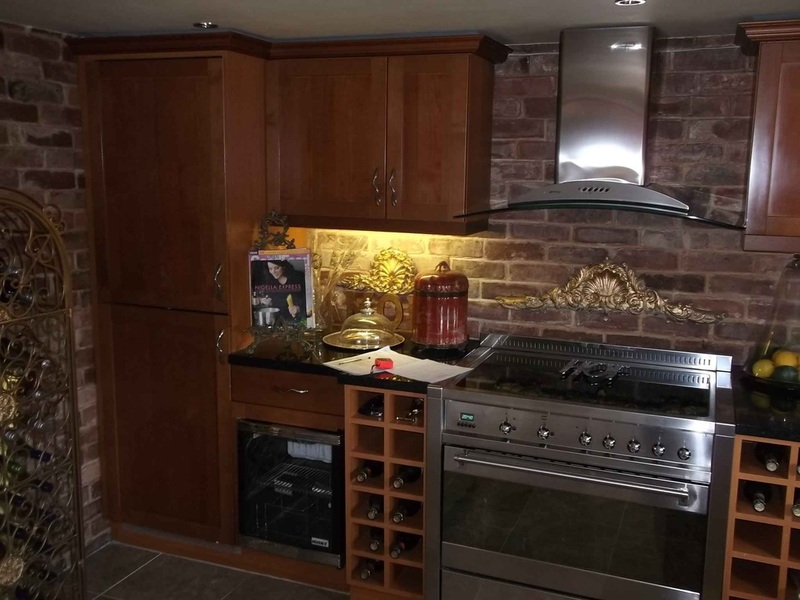 Supplying the highest quality goods and supplying the best tradesmen we will ensure your kitchen is designed, delivered and fitted to your complete satisfaction. B&Q, Homebase, Wickes, Magnet, Howdens, and of course our own range. ................... We changed the doors and a couple of cabinets to a light vanilla in a part Gothic style, we changed the worktop to rich African Teak solid wood, The sink was changed to a beige granite with traditional tap,creating a kitchen of elegance!